The text of this article was translated from Japanese. 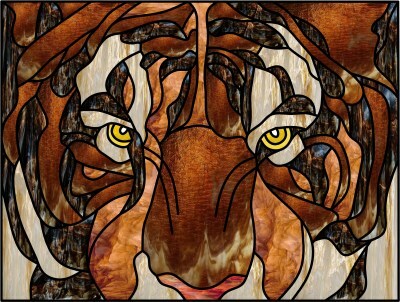 Rendering people in stained glass is challenging, and in particular faces are extremely difficult. Faces don't naturally suggest a set of suitable lead lines, and then there are the requirements of the medium: the lines must connect and the pieces must be cuttable. Thus, in my own work I have focused on flowers and animals, frequently birds. These are easier than people and are popular choices with my customers. 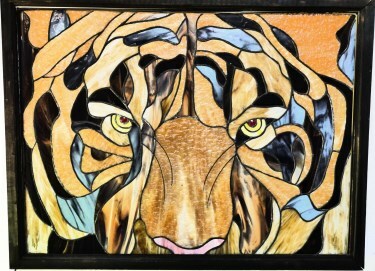 The tiger panel that I present here won an Excellence Award on a stained glass forum recently. Please enjoy. In 1998, Kenjiro Horiguchi began producing stained glass artworks in Japan. Custom panels for homes is his biggest market. Before using Glass Eye 2000, he designed on graph paper and each design took a week or more. Now with his Professional Plus Edition he reports that his design time is only a fraction of that. He has been enthusiastic enough to introduce Glass Eye 2000 to many of his peers in Japan. Unfortunately, it is not available in Japanese so only the younger people can use it! 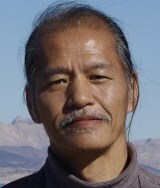 Please visit his website to learn more about him. This pattern may be used to make one or more artworks for sale or personal enjoyment. This pattern may be printed for personal use only and may not be sold or given away in printed or electronic form. Each month we feature a project designed using Glass Eye 2000. Do you have a project to share with the world? Contact Dragonfly Software and your creation might be our next Design of the Month.